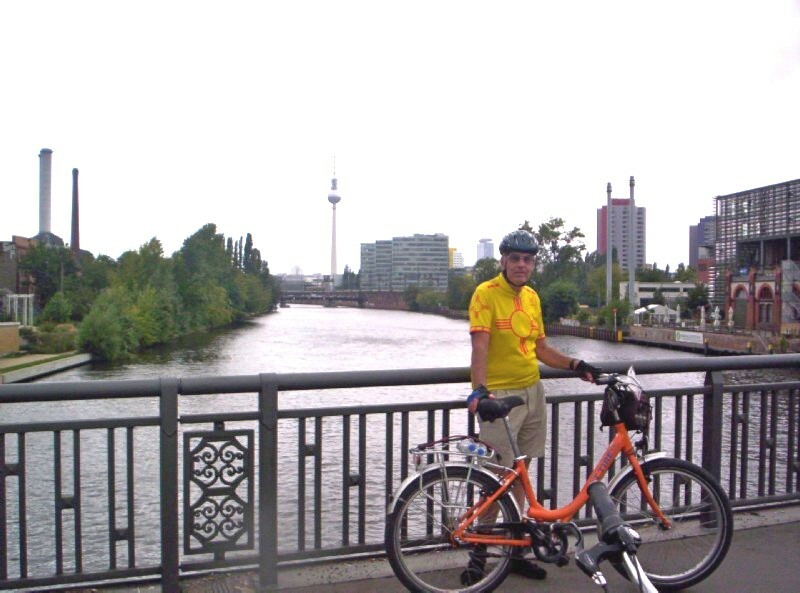 Aug 18 Thursday  sunny: after saying goodbye we biked to Hotel Berlin, Berlin, situated on Lützowplatz, a small park two blocks south of the Tiergarten and a short distance east of the Zoological Garten. 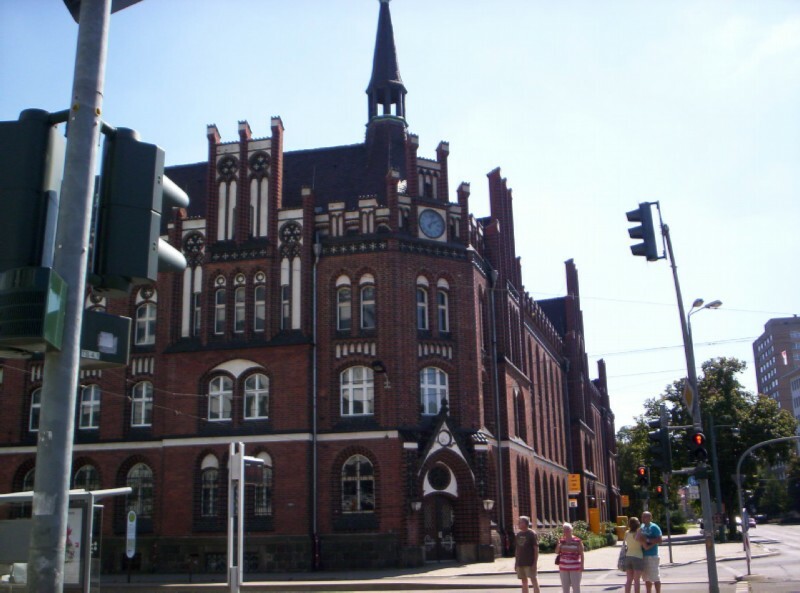 This time we took the short 8 mile route via city streets: Linden-thaler Allee, which changed its name to Argentinische Allee, left on Clayallee which changed its name to Hohenzollerndamm. All had nice bike paths. Along Argentinische Allee. Berlin is known for its trees. 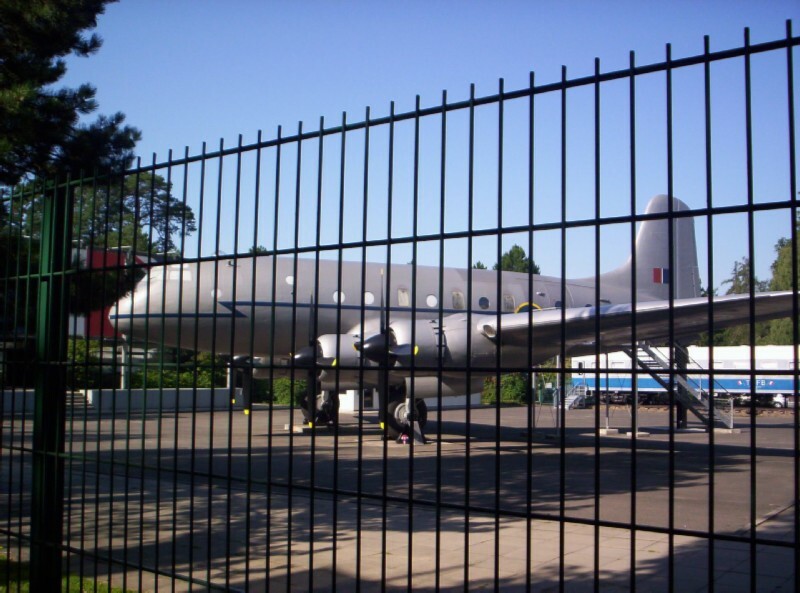 One of the surprises was coming across the Berlin Airlift museum along Clayallee. 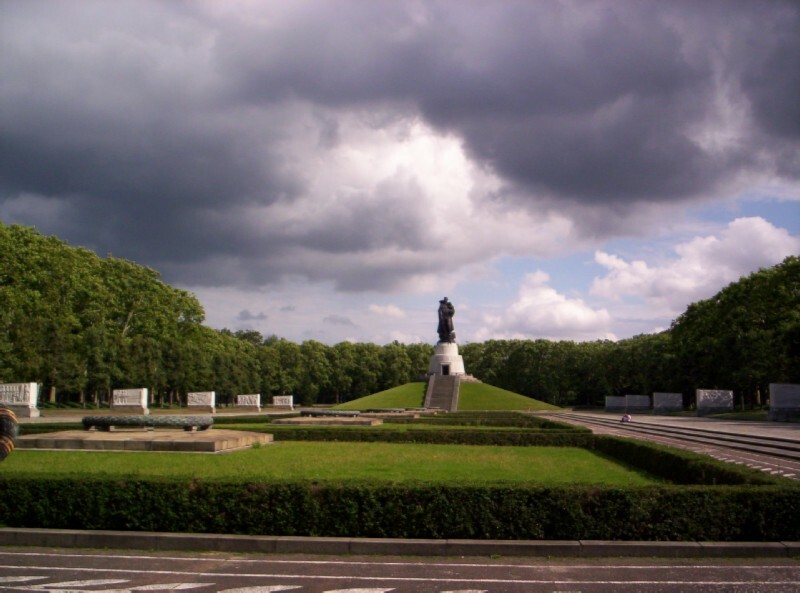 The long avenue is named after General Lucius Clay, military governor of the U.S. 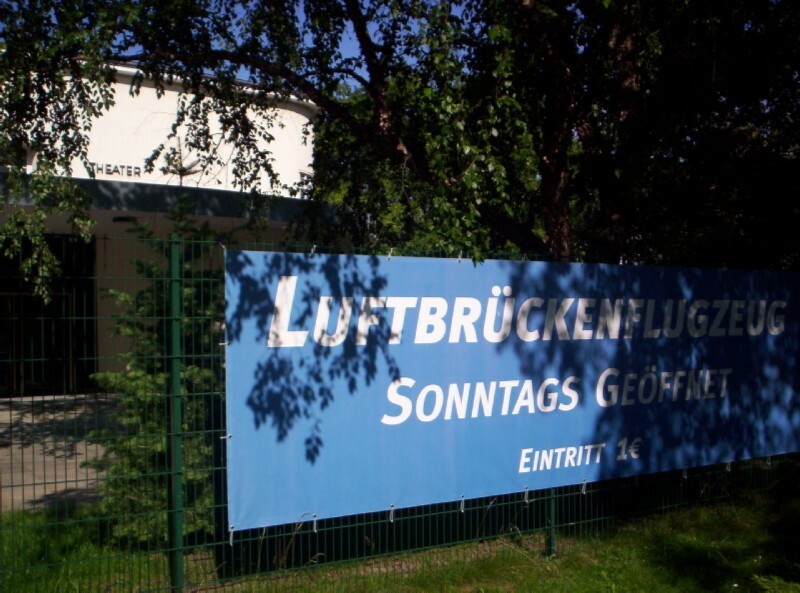 Zone after WW II and considered the "father" of the Berlin Airlift. Note: I copied this from Wikipedia which ran the two words, air and lift, together, just like one would do in German. 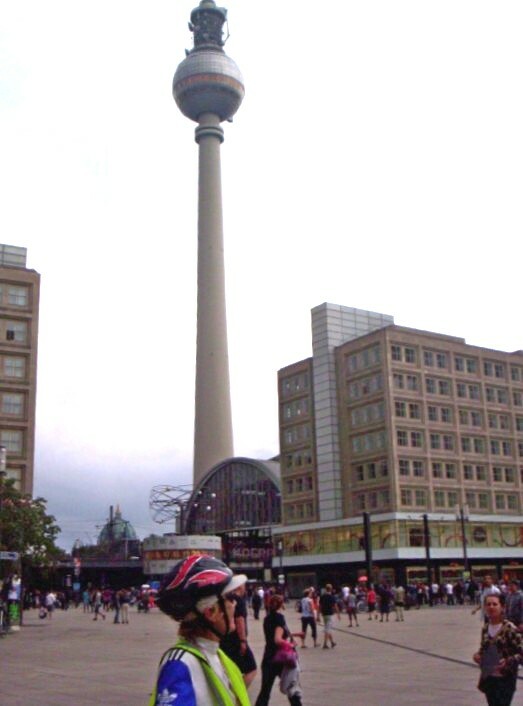 Aug 19 Friday - partly cloudy, a short drizzle: Took a The Other Berlin bike tour courtesy of the website bbbike.de. 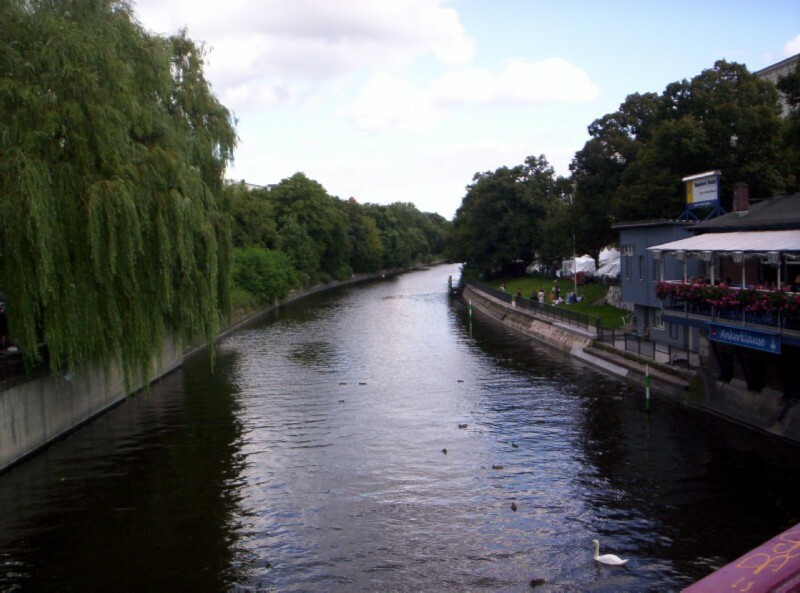 The triangular route took us to Prenzlauer Berg via Tiergarten, Kreuzberg via Alexanderplatz, Treptower Park in the Treptow-Köpenick district, and back via the Landwehr Canal. 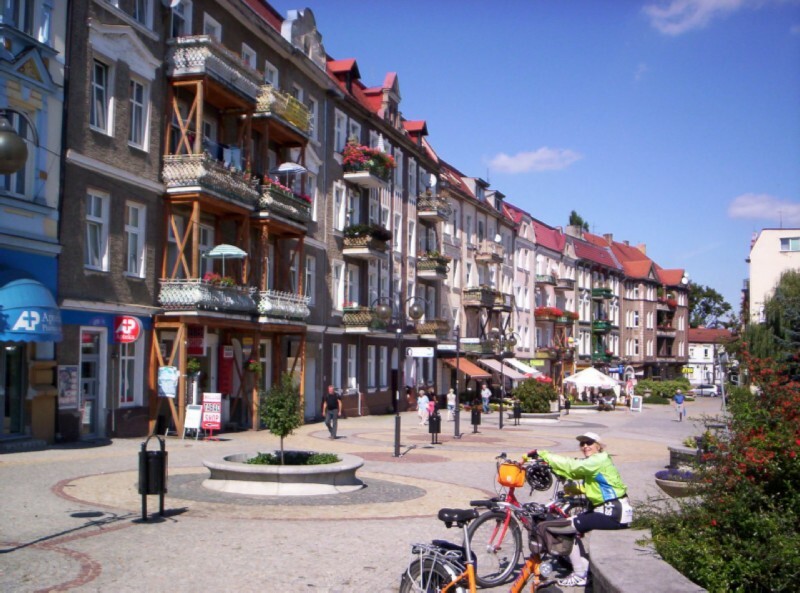 We used some bike paths along streets, some paths in parks, and some small streets. Although the bike path network is not as extensive in the former east, we did not have any trouble. 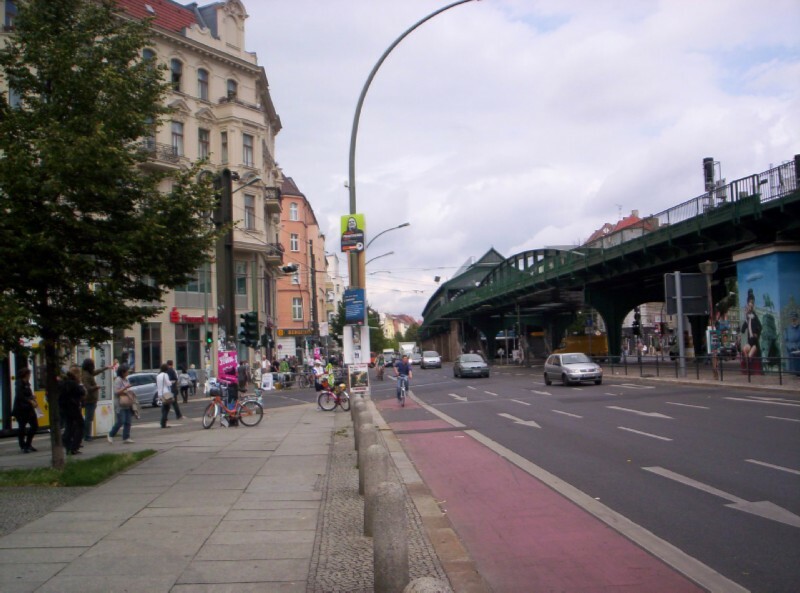 Prenzlauer Berg ranged from graffiti covered derelicts, buildings being restored, to what the travel literature talks about; e.g., one of the most popular districts in Berlin, "one of Berlin´s prettiest. 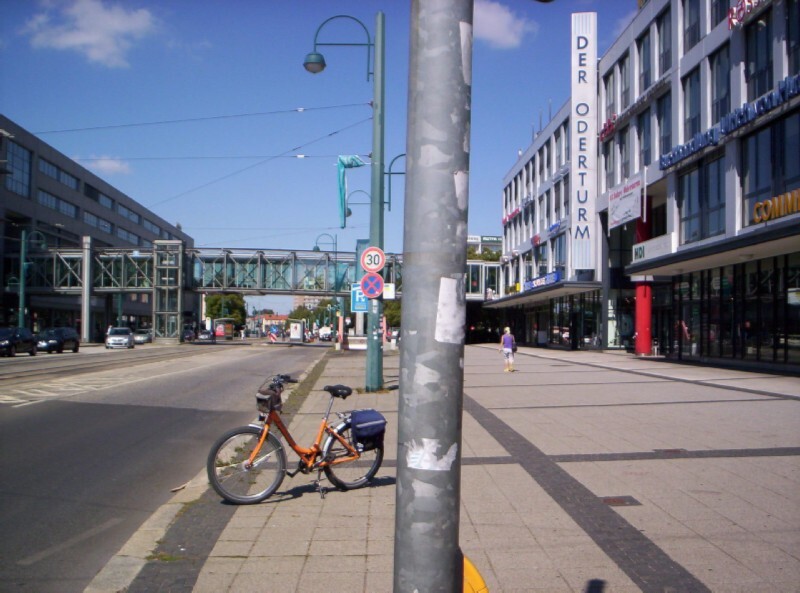 After German reunification ... became a center for more bohemian Berlin youth, while more recently it has experienced gentrification." It was too early to take in its most famous landmark, the Prater Beer Garden. 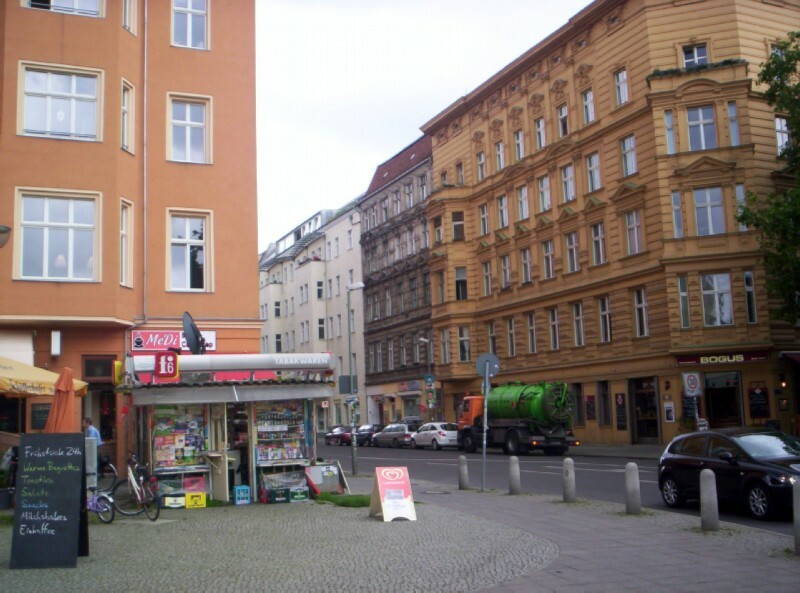 One of the more gentrified areas of Prenzlauer Burg. 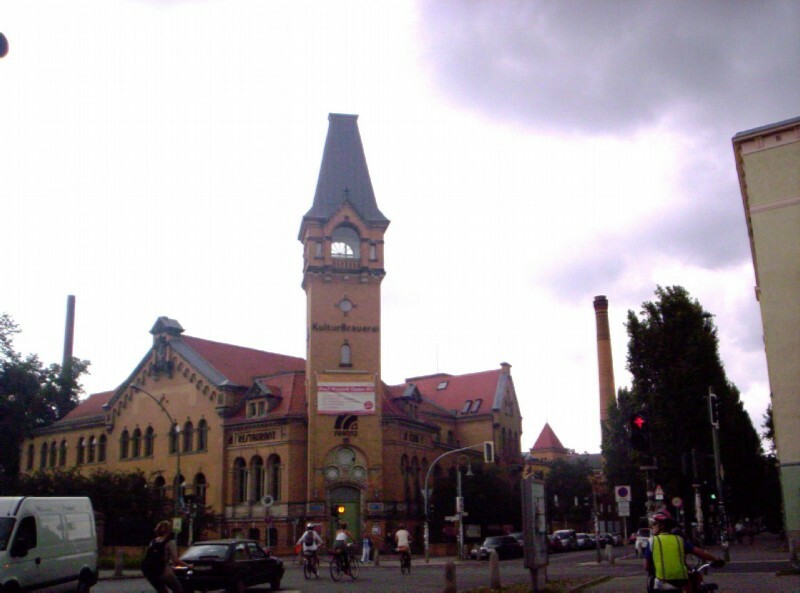 Kulturbrauerei brewery - a Prenzlauer Burg landmark. 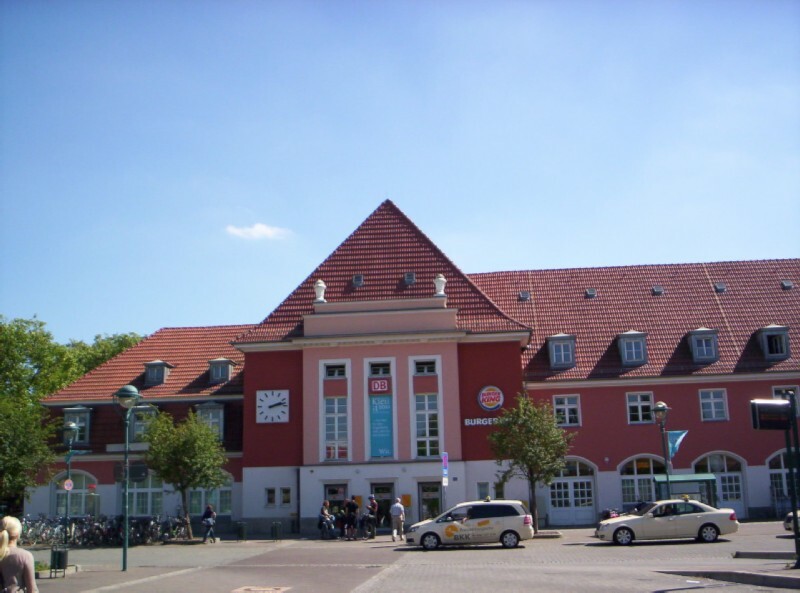 Another Prenzlauer Burg landmark - the Eberswalder Straße U-Bahn station. We had lunch on a bench in a park like setting in the middle of the boulivard. While we were here it started raining; but by the time we got our rain gear on, it stopped. This was the only rain we encountered in Berlin, a pleasant change from Austria. 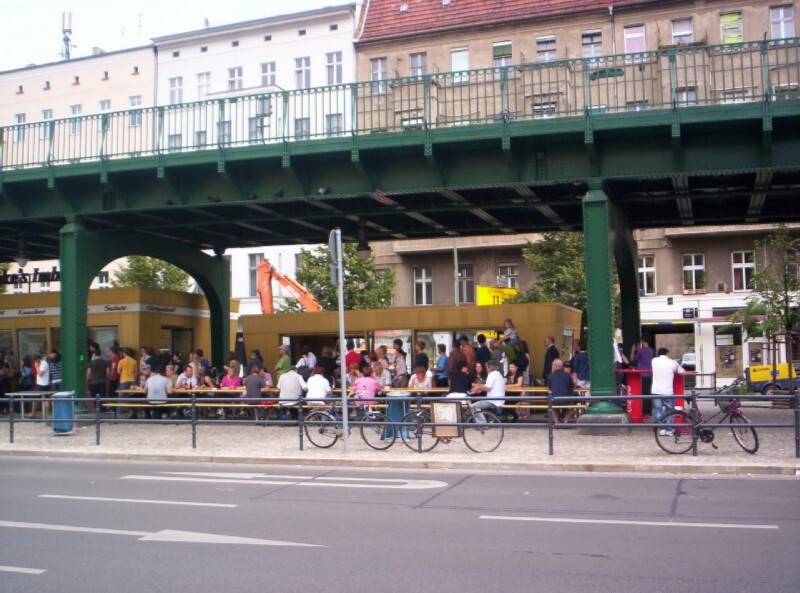 A snack bar with outdoor seating under the U-bahn was doing a land office business. 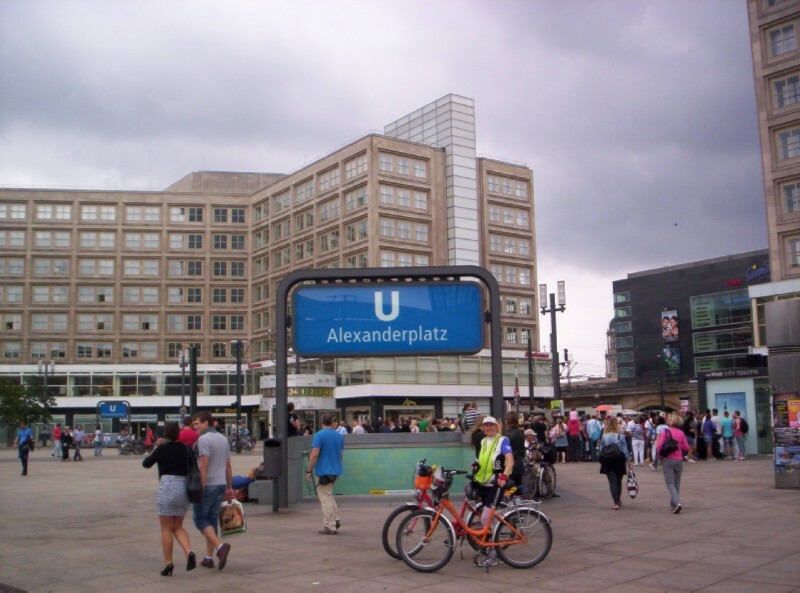 Alexanderplatz - it is so big that you can think you have arrived somewhere else, depending on which direction you approach it. Schillingbrücke (bridge) across the Spree river. 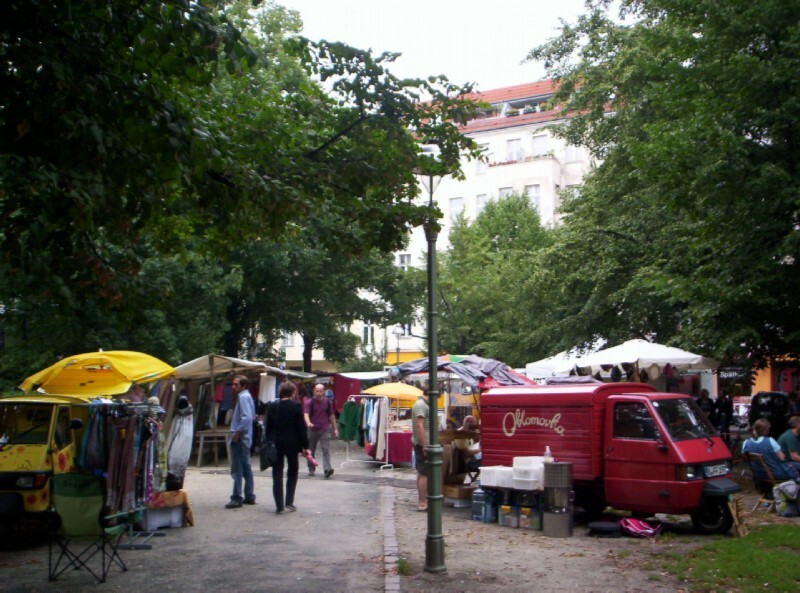 Flea market at Lausitzer Platz, a small park in the Kreutzberg district. 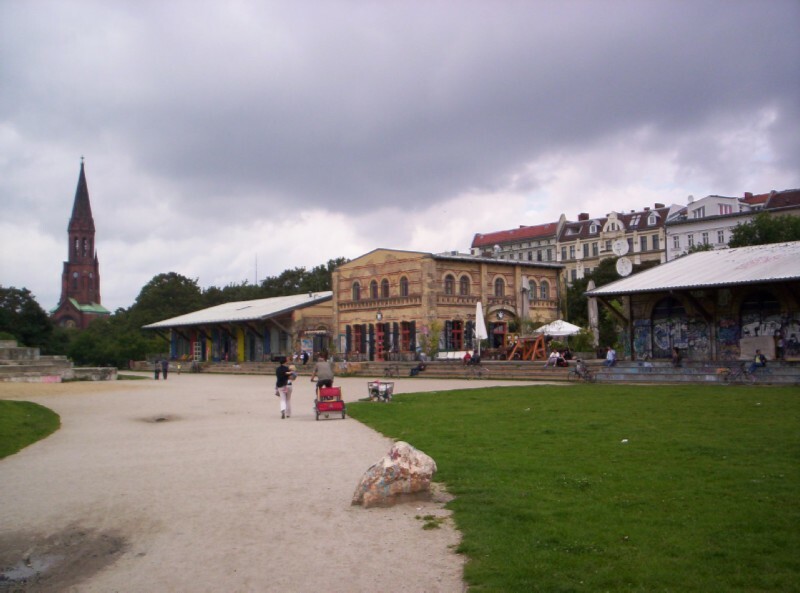 Görlitzer Park - formerly a railroad station dating to the 1860's. 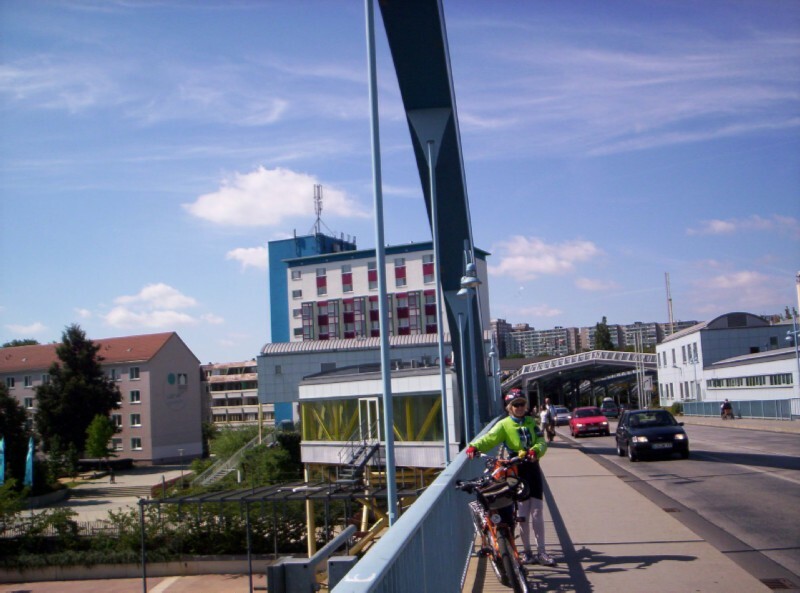 The first rail line between Berlin and Vienna originated here. It is now one of the wierdest places I've seen in Europe. Crossing the Landwehr Canal, viewed from a bike path on an abandoned railroad. 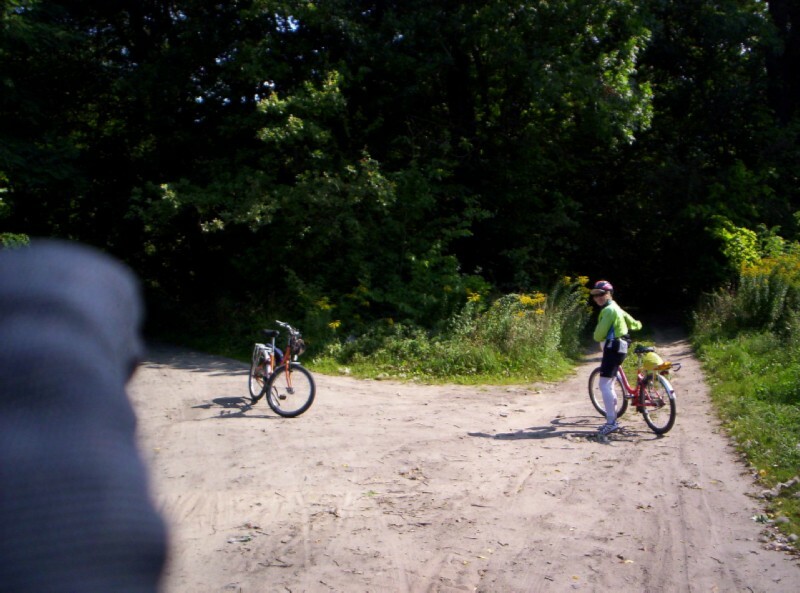 The strangeness of Görlitzer Park transitioned into the bike path. This must have been the historic rail line to Vienna. 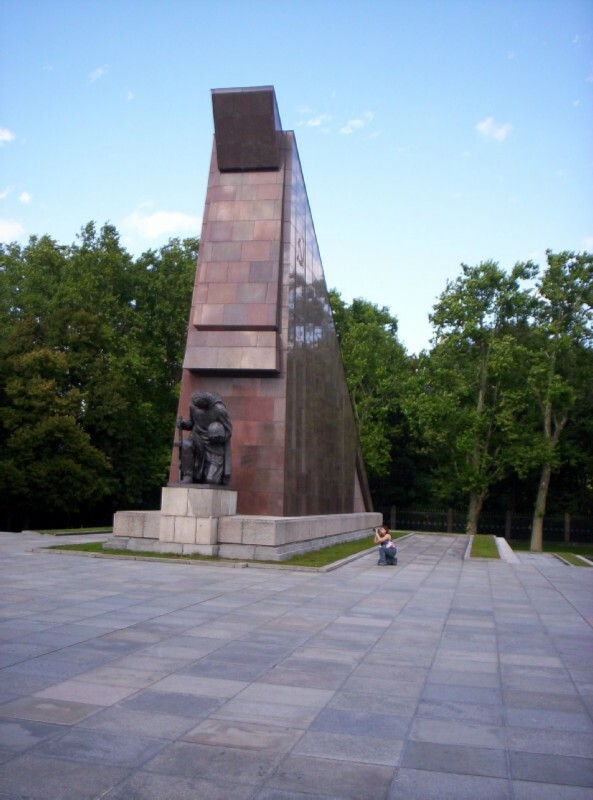 Out destination was Treptower Park in the former East Berlin which houses a Soviet War Memorial and burial grounds. 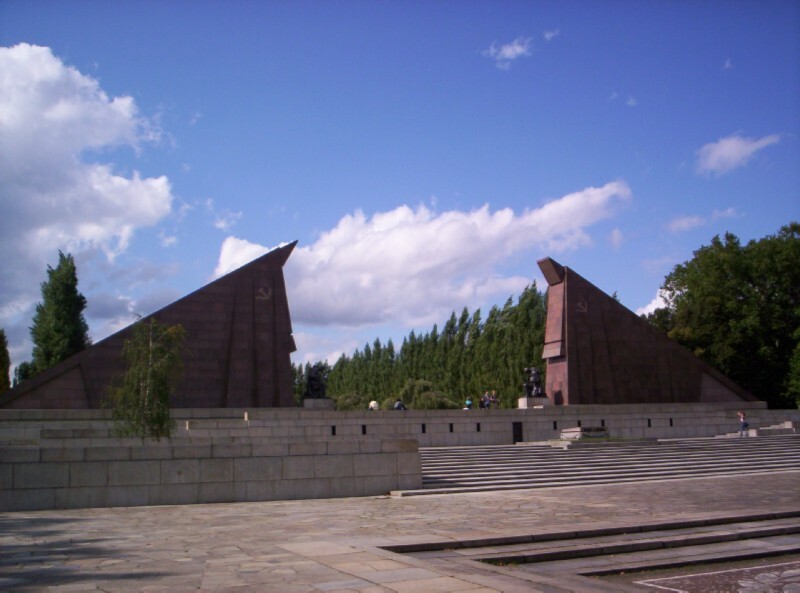 By the time of reunification, the memorial had deteriorated bady; and Germany agreed to restore it and assume responsibility for its maintenance and repair at a hugh expense. For that reason, I suppose, it doesn't get the ghetto-grafiti treatment like everything else. You weren't even allowed to ride bikes there. Before heading back we stopped at a multistory shopping center that included the closest thing to Walmart I had seen in Europe . As usual in Europe, It had a multi-stored parking garage, rather than the American style parking lot sprawl. 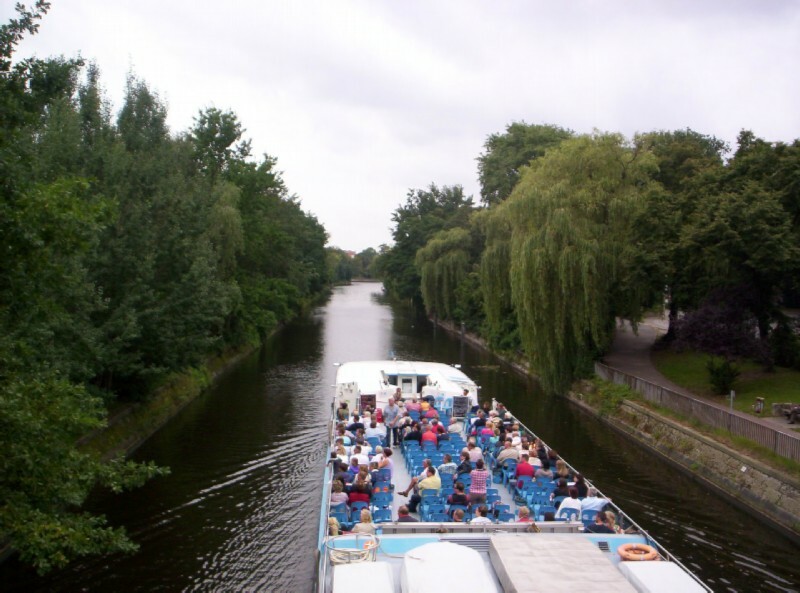 We followed the Landwehr Canal almost all the way back to our hotel. Aug 20 Saturday - sunny: In another case of unfinished business, I scheduled a short excursion into Poland for our last day. 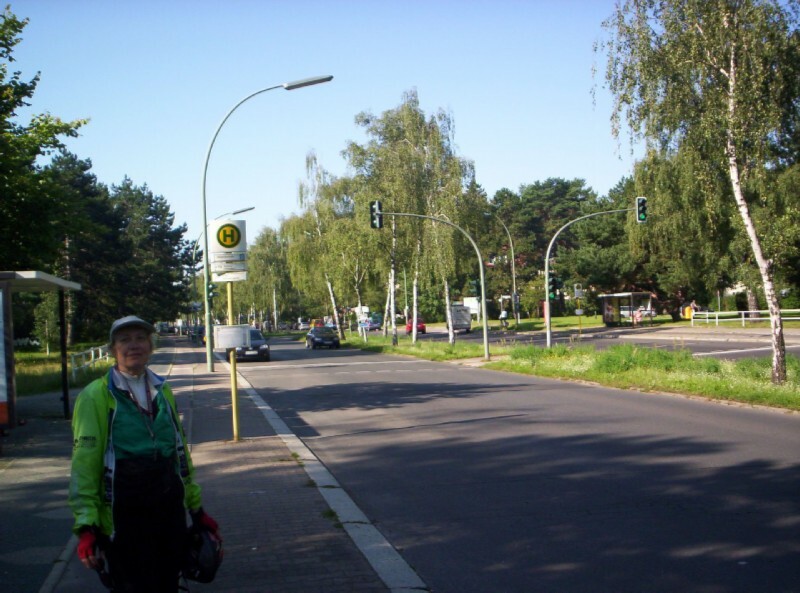 In 2005 I had planned a ride from Küstrin on the Polish border east of Berlin north to the Baltic Sea with detours into Poland. But an accident in Austria cut that trip short. So we took an REX directly from Zoological Garten to Frankfurt an der Oder that lasted a little over an hour. 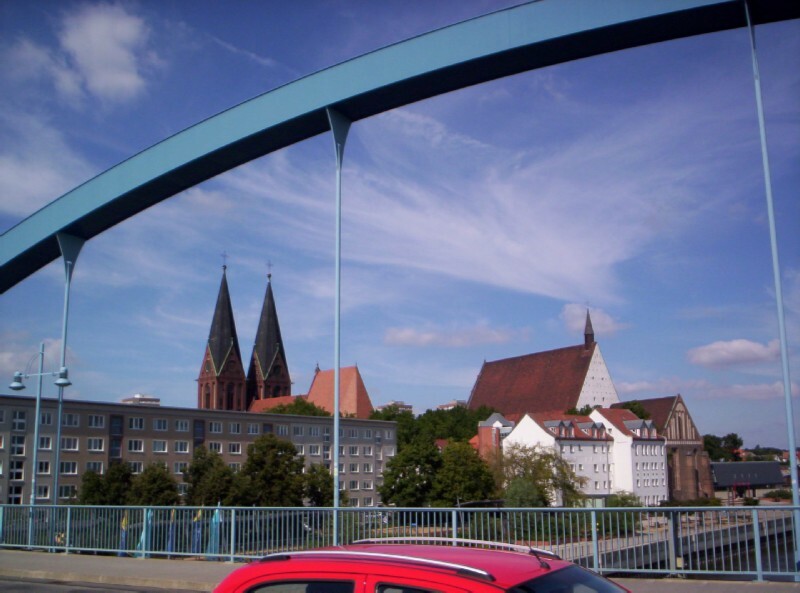 A steep downhill from the station in Frankfurt took us to the main part of town on the Oder river bottom. Before crossing the border we had lunch at McDonald's outdoor seating at the approach the international bridge. 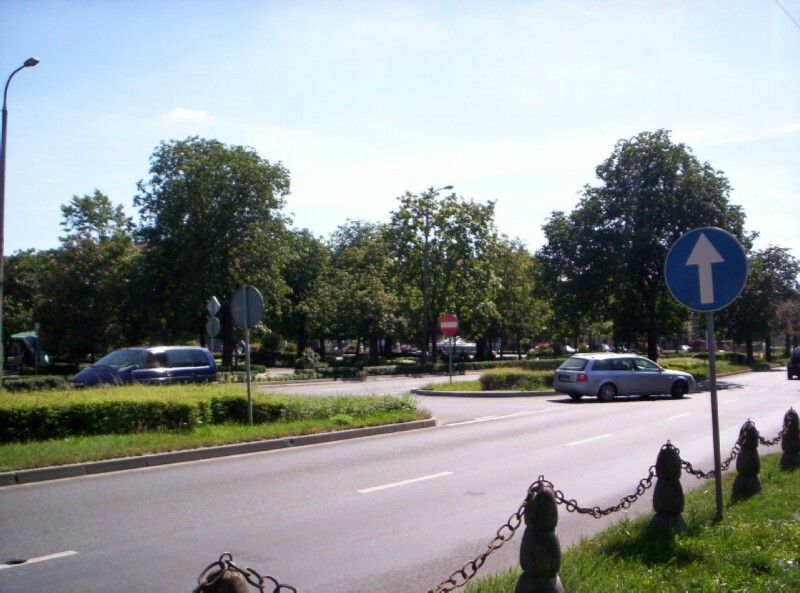 There was a lot of auto and foot traffic; and almost all the cars had German license plates. After crossing the border without any formalities to Slubice, we immediately found our way out of town on a nice country road. 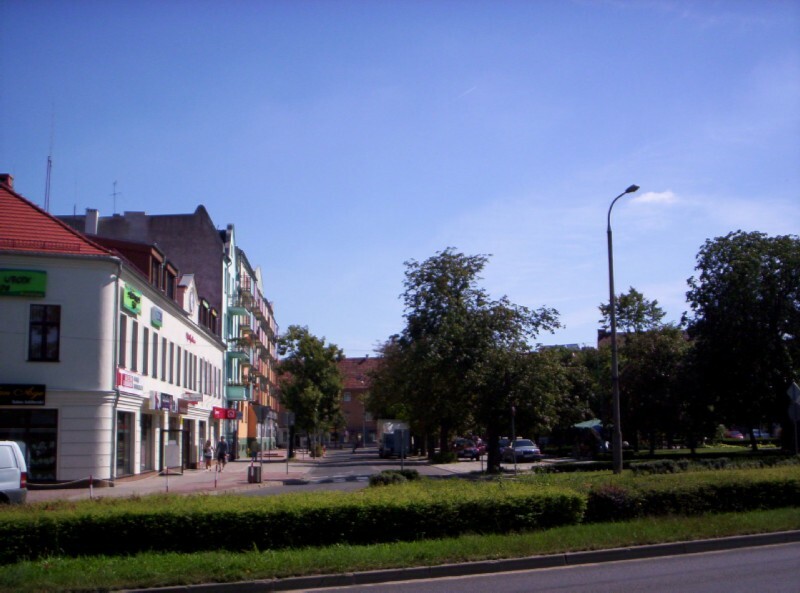 But when it ended at a main road with high-speed traffic; and a detour turned into impassible dirt, we headed back to Slubice and then back to Germany. Frankfurt station. This seemed to be in better shape than a lot of small to medium sized German stations. In fact I was impressed how nice Frankfurt looked in general. 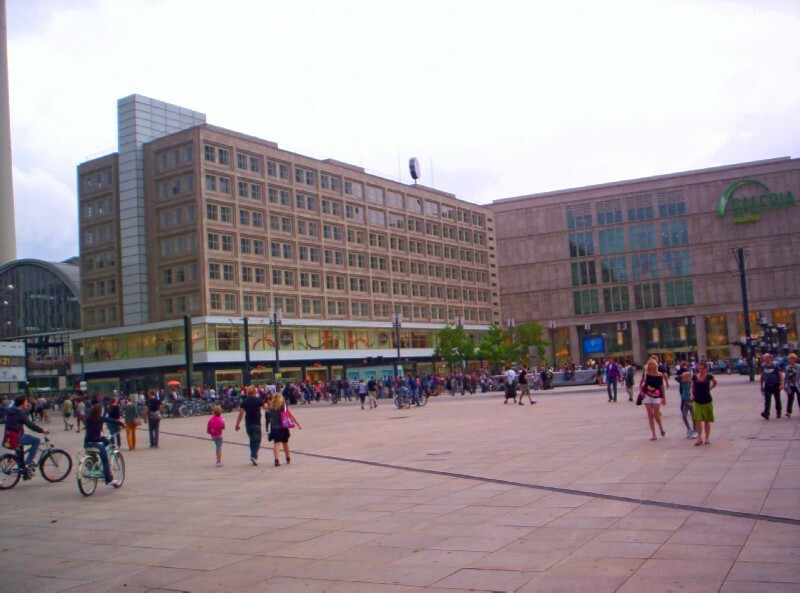 A modern shopping center in Frankfurt. I'll bet this doesn't date from the days of Communist East Germany. We picked up supplies for our Sunday train ride back to Salzburg. Another view of Frankfort from the bridge. 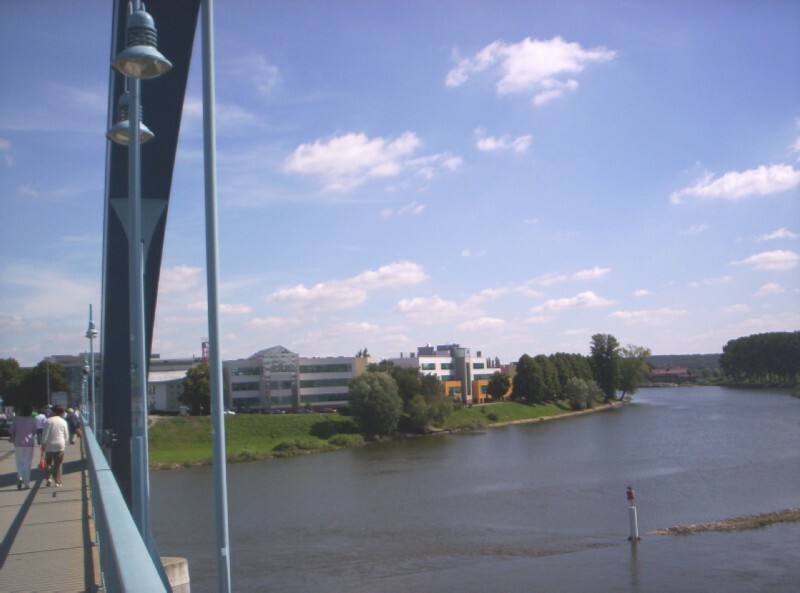 Modern buildings in Slubice to the right of the bridge as you enter Poland. 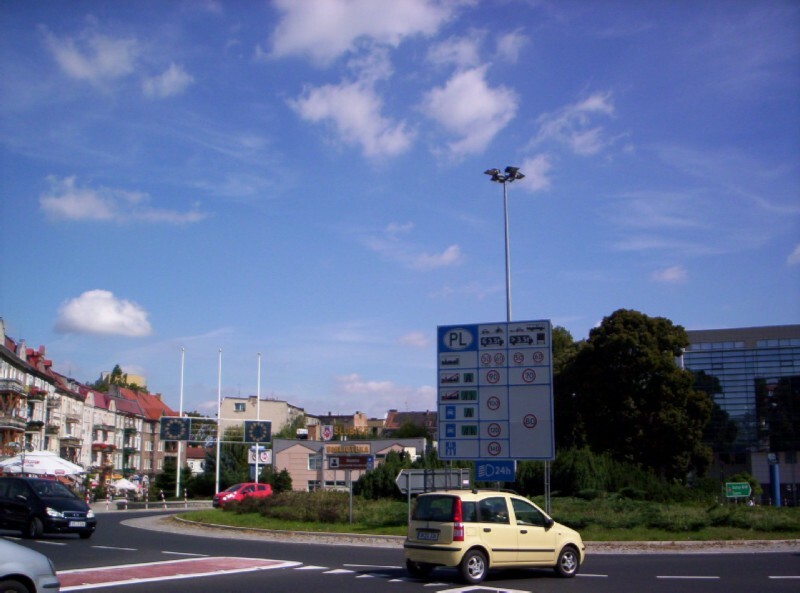 Entering Poland. The old part of the city is to the left. 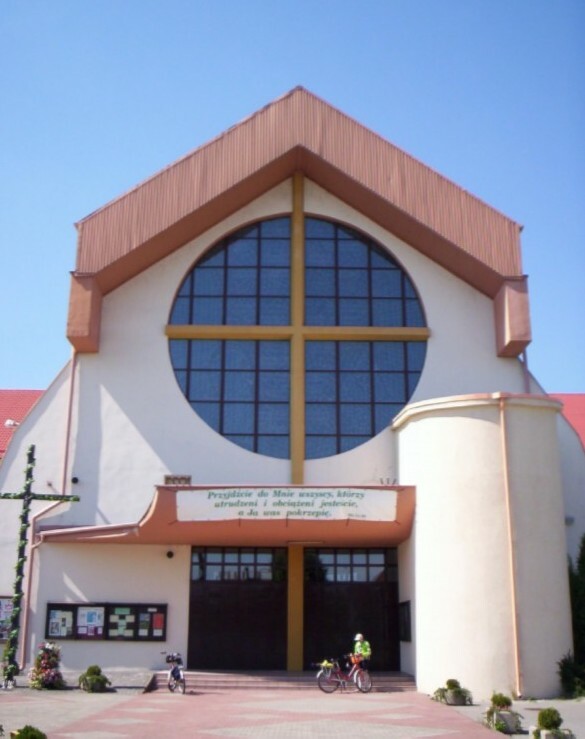 We stopped at this very modern church in Slubice. Heading out into what I thought was the country. 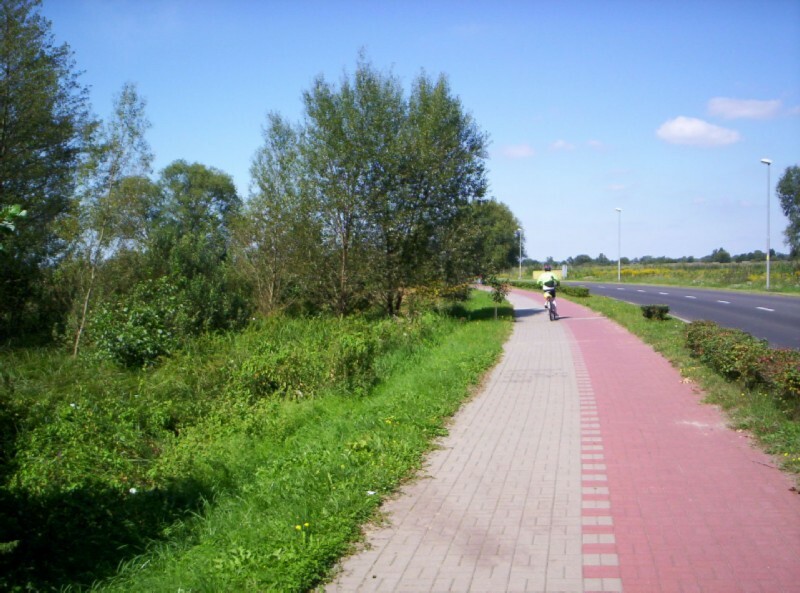 Even Poland has bike paths. 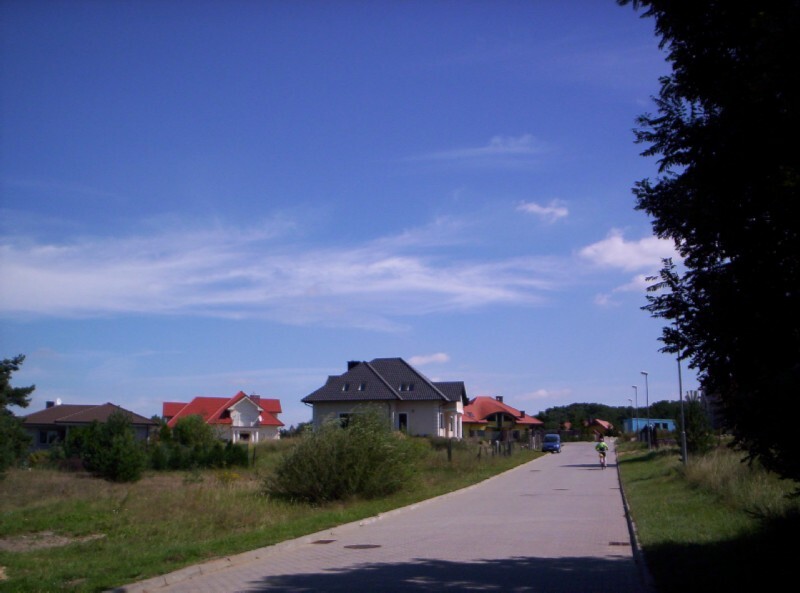 What looked like a small village in the distance turned out to be a Polish version of McMansions and urban sprawl. At the end of the subdivision, the street ended at a main road with truck traffic. So we turned around and tried a different country road we had passed earlier. But Google maps failed me. The country road quickly turned into an impassible dirt lane. On the way back to Berlin we got off the train at the multi-story, multi-direction main station. It took some work, but I was finally able to locate the platform where tomorrow's ICE to Munich would depart from. 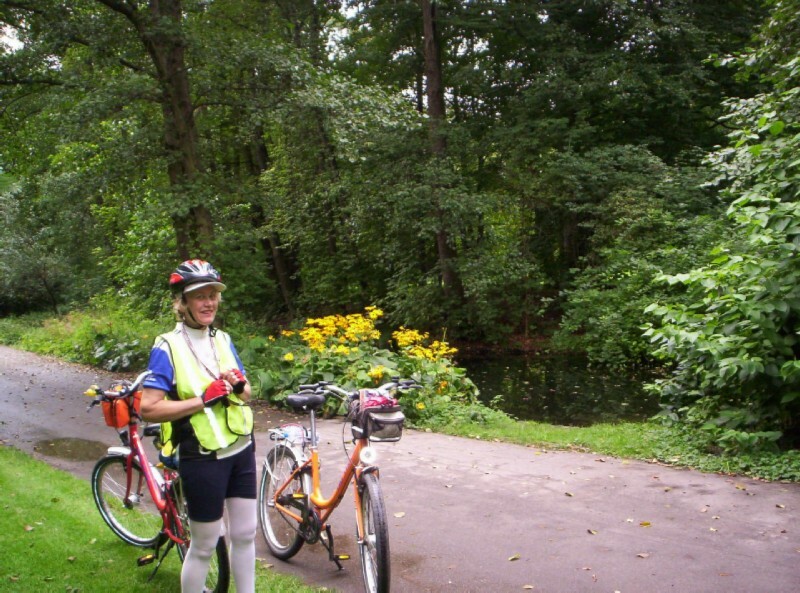 We rode back to our hotel through the Tiergarten. 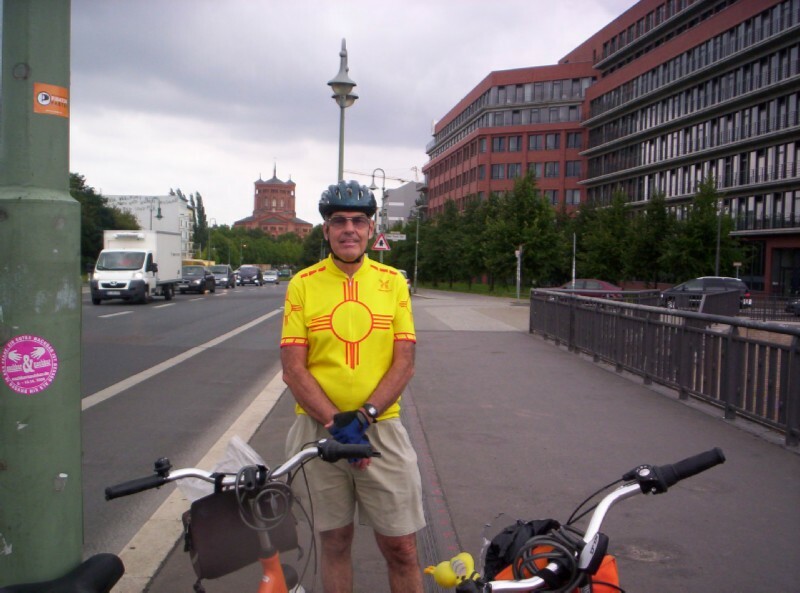 After resting up back at our hotel, we returned the bikes to Stadt und Rad by the Zoological Garten station since our train the next day left from the main station and the rental shop didn't open early enough to turn them in and get to the station. When we turned them in, we had the shock of our life. Because of the lock and cable snafu, the owner refunded the entire 5 day rental fee for both bikes, 90E. We broke up the 1 mile walk back to the hotel by stopping at a small Turkish restaurant for supper. We both ordered the döner plate. The döner portions were so large that we were only able to finish one between us; so I had a tasty döner sandwich for lunch on the train to Salzburg the next day.